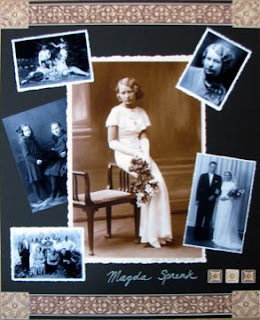 My Grandma Magda died yesterday. It was such a beautiful weekend and so many great things occurred, but they seem rather distant now. I'll write about those things on my studio blog. My head is full of so many confusing thoughts - I've lost people before, but I've never felt so much guilt and... loss... before. I keep hearing people say "she was old" "she's been gone for a while now" "she's in a better place". All true. But it's so permanent. She was a very lively person until she had a heart attack, then a stroke and then little combinations of those until she was no longer recognizable. The person we've been visiting at nursing homes for the past few years was not really my grandmother. She perked up a little about a year ago. I liked to bring Lilah (age 1.5 at the time) to visit her because they both ate the same foods, wore diapers, had similar motor-skills and got excited over new nail polish colors! The last time I saw her laugh - for real- was about six months ago. She was sitting in her wheelchair, Lilah and I were sitting on her bed. She made a comment about being forgotten... Lilah threw "fat kitty" at her. Gramma caught the cat, and threw it back at Lilah. It bounced off her head and fell to the floor. Gramma started laughing. We were all giggling as the cat went flying back and forth. The last time I visited her was on Easter. She didn't care at all that we were there. If anyone touched her or moved her chair she would scream an awful high-pitched wail. I almost burst into tears right there. But Alex and Lilah were freaked too. I decided I wouldn't go back. I did go back, yesterday, when we got the call that she had died. I wasn't going to look at her, but I did. I was kind of relieved to see she looked exactly like she was asleep - about to start snoring. But her face was so smooth. I always think of her with such smooth skin. My grandmother was so beautiful. Even when she was "old". But in the last few years, as her spirit left her, she looked like someone else. I was glad to see that she looked like herself again, in death. I try to console myself that she is now with the two people she always loved the most - her husband and her lost baby. (Merike died in a shipwreck when she was about 2.) But I don't feel better at all. My daughter is 2 and ... ack. And she never appreciated the daughter who survived. I wonder if that is why she held on for so long... to try to patch up past hurts? I am glad that I took her to California to visit my brother. I'm glad I took her to Arizona to visit her best friend. I wish I had forced her to go to Estonia to see her family again. It's so ironic - she was afraid she might die there and have to be shipped "home". That was ten years ago. I've been missing her, her food, her traditions, her listening, her useless advice - given with love ("the man of the house is always right"). Every time I've visited her in the past year, I've mourned her loss. It's no surprise at all that she is dead... and yet, it feels so unfinished. She survived so many things and she was hanging on for the past few years... for what? What was the purpose of everything she went through? I love you so much, vanaema. Your mom emailed me... this is so wonderfully written. Sorry.